In this section, you will learn how to migrate from a Portfolio for JIRA classic plan to a live plan. Depending on the size of your plan, this can be quite a lengthy, involved process, so this guide is intended to provide simple step-by-step instructions to help migrate your data. Why should I migrate to live plans? 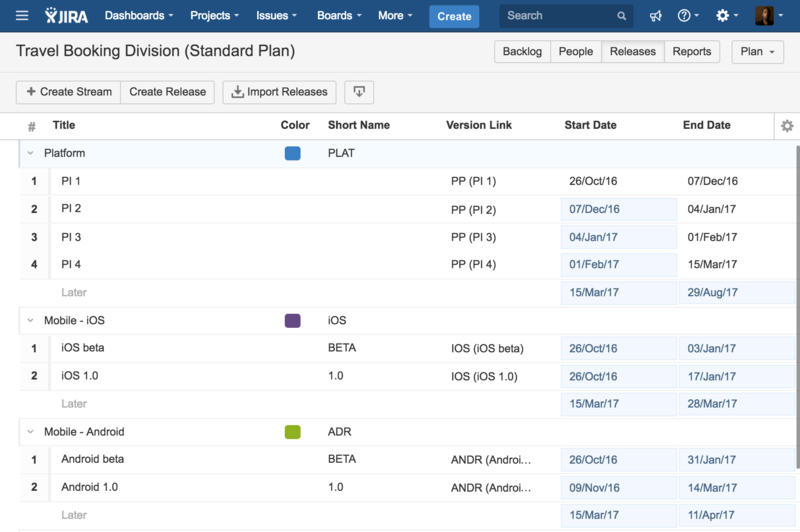 Portfolio for JIRA live plans are regularly being updated with more great features, including live integration with JIRA. How do you know you're using a classic plan? The main difference between classic plans and live plans is the schedule location. In classic plans, the schedule is located at the bottom, while live plans have the location at the top. Initiative relationship - Initiative ↔ epic relationships will not be automatically set when migrating to live plans. Issue links are created between epics/initiatives on the JIRA ticket but you'll need to reset the Initiative for all your epics. Themes - They exist in live plans, but cannot be transferred over from Classic plans. Team data - Teams, team members, availabilities, velocities will not be migrated over. Configurations of your plan, for example, default estimates. Future sprints - Live plans have not implemented the future sprint functionality at this stage. In this case, you’re not likely to get the same calculated schedule result. Please vote on this ticket if this you require this feature in Live plans: JPO-59. 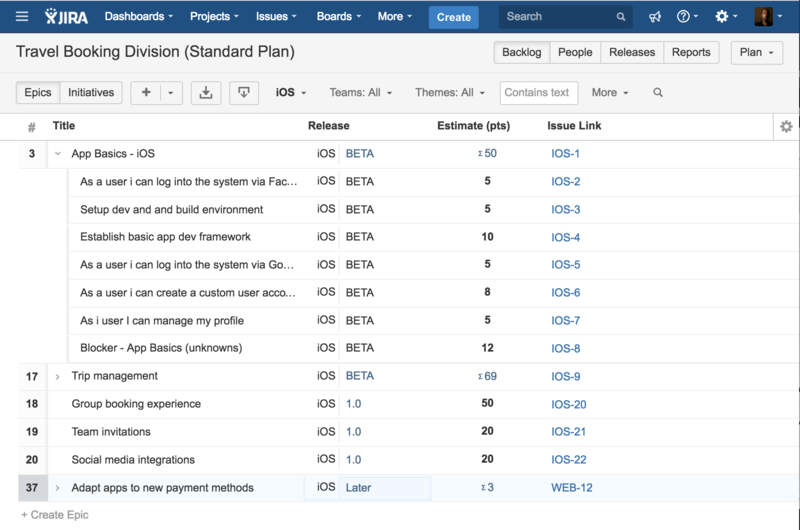 Create projects in JIRA for all your Classic plans issues. Store the data of your classic plans in their respective projects. Use the projects/boards to created as "Issue sources" to create a new plan. You first have to choose how you want to group your issues into separate projects. Ideally, you should group your issues by release streams, but you can also group by teams. a) Create a new project for each of the Issue groups, for example, one project per stream. b) In the project creation dialog create a Scrum or Kanban board depending on how your teams operate. Boards are the most recommended issue source since the improved integration between live plans and JIRA offers more control over boards. c) If you’re using initiatives it is recommended to create a Kanban project to store all the initiatives. In the settings for this project remove all other issue types and create a new issue type for “initiatives”. This is also a good time to create the Initiative level of hierarchy for Live plans. Live plans allow you to create infinite levels of hierarchy but by default, it only goes as high as 'Epic'. 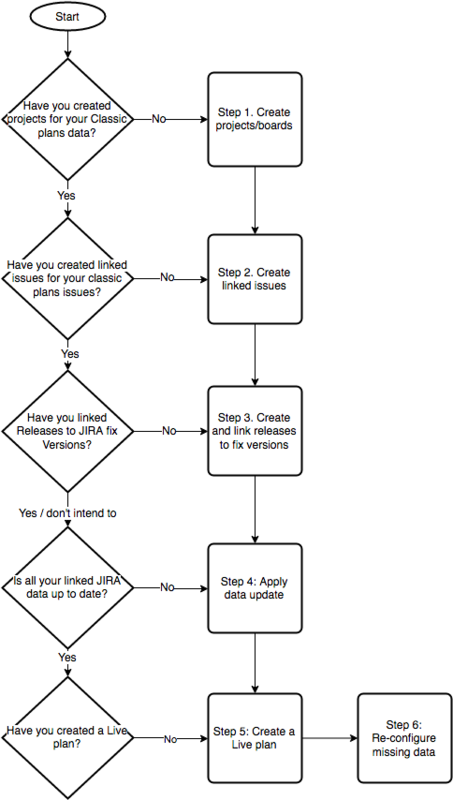 Once you’ve created your projects, it's time to create and link issues in JIRA from your classic plan issues. 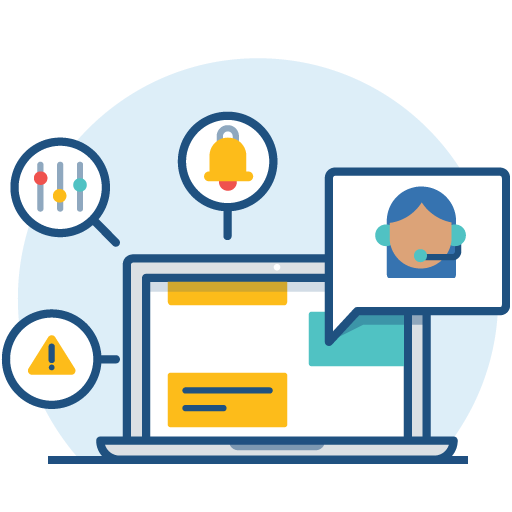 This process will create a JIRA version of all your issues and store them in JIRA projects. In your classic plan enable the Issue Link column. Start off by creating linking issues for your Initiatives (if you're using them). Set the view to Initiatives and for the first item select the dropdown in the Issue Link column and click Create and link new issues. In the dialog select your Initiative project, disable Create issues for all related items (only disable this for the Initiative step) and click Create and link issue. Do this for each initiative. Once you have all your initiatives stored as linked issues in JIRA, go ahead and do the same for all your epics and stories. In your classic plan, filter by the grouping you decided on earlier (e.g by Release Stream). For each epic in the filtered scope click on the Issue link drop-down and select Create and link new issues. Set Create in project the relevant project you’ve created for this filtered group. Now enable Create issues for all related items so that the epic and all its stories are linked to JIRA tickets. Make sure that none of the initiatives are selected as they are already stored in a separate project. Repeat this process for each project grouping. When completed, review all your issues and make sure they have an issue link. This will take some time if you have a lot of initiatives or epics in your plan. Make sure you have the correct Project selected in the issue link. If you create the issue in the wrong project you would need to manually delete those issues from the project to set it right. This step is recommended if you want to transfer all your releases into a live plan as well. You can create linked fix Versions in each of your projects from your classic plan. On the Releases tab, for each release click on the drop-down next to the title and click Create and link new versions. In the dialog select the relevant project and click Create and link versions. You can also link your classic plans releases with existing fix Versions you may already have in your projects. To link a release with an existing fix Version go to the Releases tab in your classic plan. Expand the streams and use the Version Link drop-down to associate each release to the respective fix Versions you created in the JIRA projects. Each Stream maps to a project and so each release stream maps to the fix versions in the linked project. a) Once all your issues and releases have been linked, you'll need to apply some additional data to your JIRA issues and versions. Only data you manually set manually will be applied (i.e Calculated data will not be applied). b) Click plan and select Apply updates to project/s. c) Disable Estimates and click update. Estimates are already applied when you created/linked the issues. Disabling this is to prevent Epics with aggregated estimates from having that value applied to the JIRA issue. This would cause that Epic estimate to essentially double when you create your live plan. If your estimates on the JIRA issues are not up to date then we recommend you enable and apply the estimate updates in this step. Then when you get to Step 6, remove that additional estimate from epics with children. At this stage, you should have all your issues and releases with their associated data stored as issues in JIRA. Each of your Issue/release groupings would have their own project and board which we can now use as Issue sources for your Live plans. Go to Create a plan via the Portfolio dropdown to start the Plan creation wizard. Add a name for your plan in the first step. In step 2 select all the boards you’ve created for your classic plans issues. In step 4 each of your issue sources will automatically create an associated team. Configure these to suit your teams. Note this will also mean that your initiative project will have an associated team so it’s recommended you delete this one. In step 5 make confirm the scope of issues and click done. Sprint assignment: Sprints are only assignable to ones that exist in JIRA. Create sprints on your scrum backlog so they're assignable from Portfolio. Note that assignee will not be set as the team member unless the assignee is in a team in your plan and you've set the Issue assignee import level in the configurations. If you're having problems or need additional help migrating from classic plans, please visit our Support section and create a support request.